After living in Vietnam for over 7 months without traveling north of Hue, I finally made it to Hanoi recently for a business trip. With no appointments on my first day, I was free to tour the city and sample some northern cuisine straight from the source. Overall the trip was a pleasure, even though I was annoyed by the constant pestering by cyclo drivers, travel book vendors, and sunglass sellers in the Old Quarter. 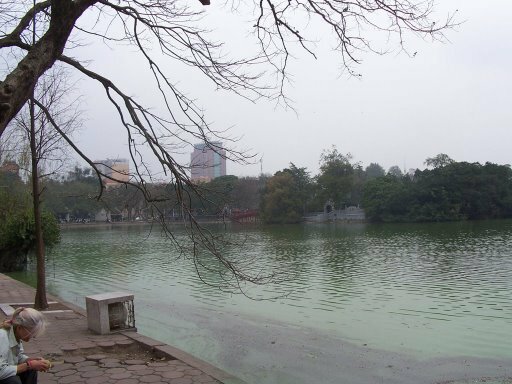 The city’s collection of lakes and copious (relatively speaking) green space were a breath of fresh air, and I found it surprisingly easy to converse with the locals, despite their ‘zzz’-laden accents. Maybe Rosetta Stone Tieng Viet was a worthwhile endeavor after all. When I arrived at the hotel, my room wasn’t ready yet, so there was nothing to do but go ahead and start eating. My first destination was a banh goi vendor recommended by gas•tron•o•my reader Wandering Chopsticks (and also, amazingly, my Rough Guide tour book. 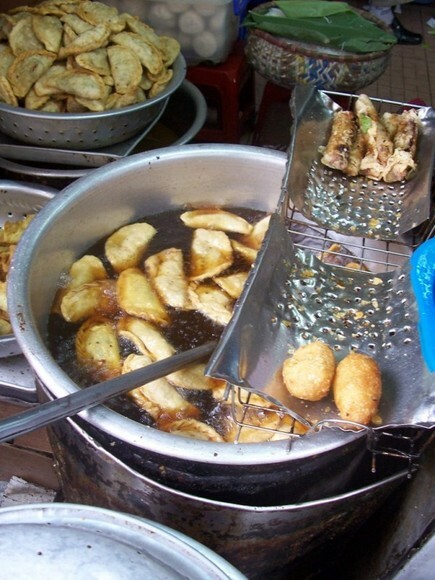 The Rough Guide’s section on street kitchens in Hanoi is a gem—I’ve never seen anything so useful in a mainstream guidebook). I had no trouble finding the stall with a variety of deep-fried treats. I wanted to try them all, but I had already planned to follow-up the snack with a lunch of bun cha, so I limited myself to a single banh goi. 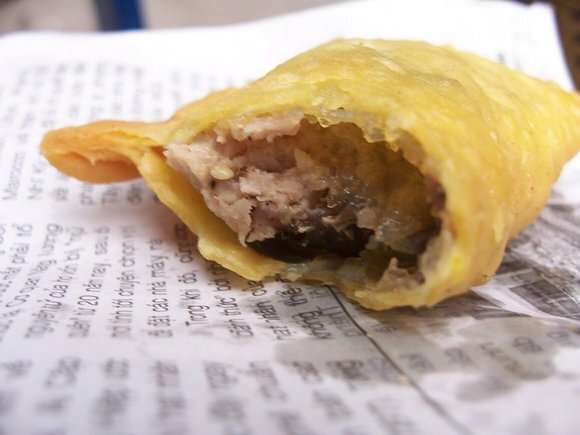 The first two bites were amazing—hot out of the frying oil, the flaky exterior melded wonderfully with the fatty meat inside. Banh goi are similar in appearance to empanadas, Cornish pasties, and the southern Vietnamese banh xep, and for a blissful minute I thought it was better than any of these. I loved the onions mixed in with the meat—something banh xep lacks. Unfortunately, my third bite was nearly entirely mushrooms. Unlike The Gastronomer, I am simply not a mushroom fan, so the powerful taste was an unpleasant surprise. The rest of the banh goi had an even mix of meat and fungi, but in the final analysis I’d have to rank it slightly below banh xep. When I was almost done eating, I saw a couple nearby dipping their banh goi in some sort of sauce. I’m not sure why I didn’t get any—maybe it’s considered too pungent for a white man? In any case, I’ll have to get some next time I head up north. 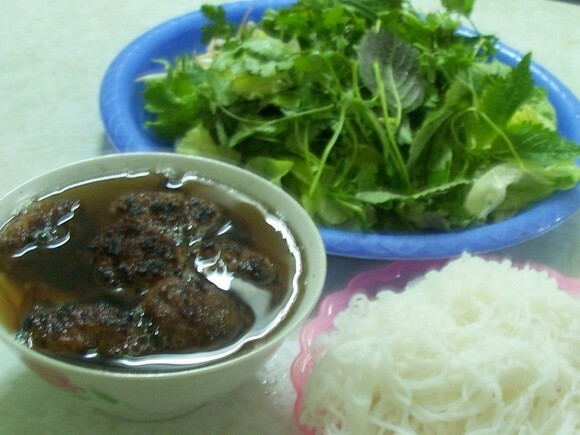 Next up was Bun Cha Nem Cua Be Dac Kim (67 Duong Thanh St.), which was recommended by another reader, Teddy. Bun cha is one of my favorite dishes in HCMC, so I was stoked to try the original version. The two are relatively similar in style, but northerners don’t bother to mess around with a second bowl. Instead, they add their noodles and greens bit-by-bit to the meat and sauce. I tried this eating method once in Saigon and found it cumbersome, but it was much easier at Dac Kim because the bowl of pork patties was HUGE—probably three times more meat than a typical southern portion. The vinegary broth, with significantly more spices and nuanced flavor, was terrific. I think it’s safe to say that this was the best bun cha I’ve ever had. 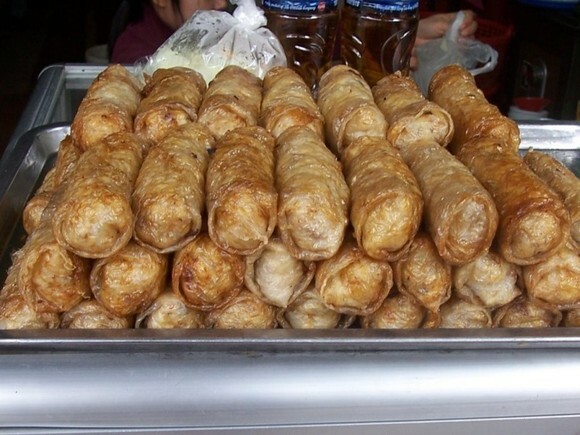 Even though I generally prefer pork to seafood in fried spring rolls, I felt obligated to try one of the nem cua be. And I was glad I did. The nem was wonderfully crispy on the outside and filled with large, loosely packed pieces of crab. It wasn’t cha gio, but it was damn good. If I hadn’t been so full, I would have gladly paid 7,000 VND for another. Even after an hour-long run through the city parks, I was still totally stuffed from lunch and could only manage a light bowl of pho bo for dinner. I stumbled upon a random stall about a block from my hotel and decided it looked as good as any. The pho was solid—much better than the watery versions of pho bac I’ve had in Saigon—but it didn’t stand out as an all-time favorite. It was a nice feeling to be slurping down a noodle soup on a cool evening, away from the endless scorching summer of the south. Apologies for the lack of pictures—my camera goes to bed early. By lunchtime the next day, I was ready to feast again. 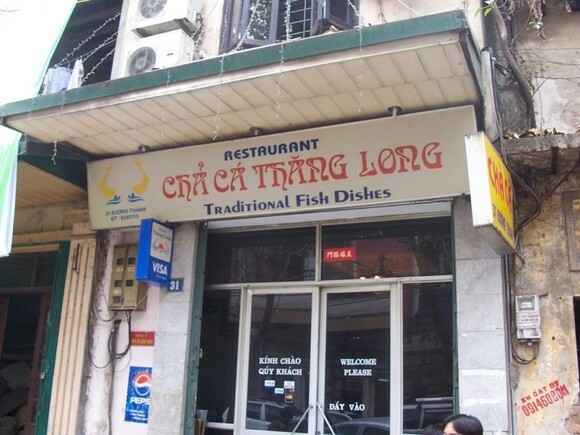 I couldn’t leave town without trying cha ca, perhaps northern Vietnam’s favorite dish, so I followed the Rough Guide’s recommendation to Cha Ca Thanh Long at 31 Duong Thanh Street. I didn’t really know what to expect, but I was quite impressed. The cha ca experience is much like hot pot—a rollicking meal cooked on the dinner table and shared with friends over a few beers. As such, it didn’t quite feel right eating by myself, but I still couldn’t help enjoying the meal. 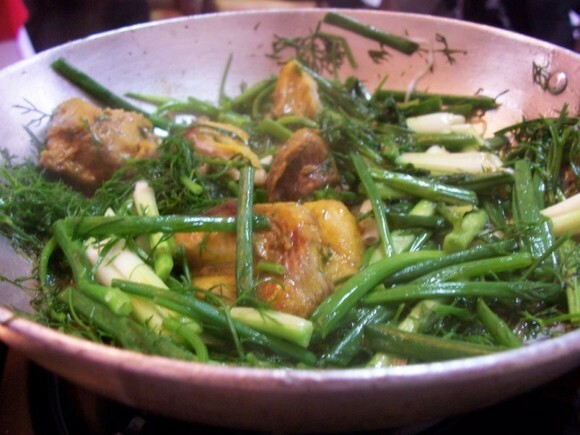 Herbs, particularly dill, play a major role in the dish. They are simmered along with the fish patties (cha ca) and scallions in a well-oiled skillet on the table, and diners reach in with their chopsticks and grab a few pieces to add to their bowl of bun. 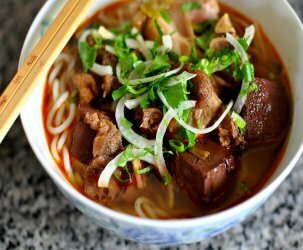 Thanh Long’s excellent nuoc mam was the perfect addition to each bowl. 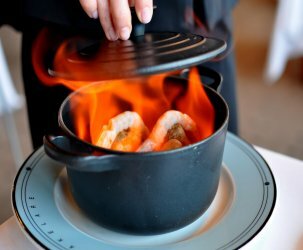 It all made for a classic eating experience, and I left Hanoi totally satisfied. That stall was fun–I’m definitely excited to try the other fried dumplings, nem, etc. I actually just returned from Hanoi again yesterday (this post was long overdue), so another blog will be coming up shortly. I stopped by the bun cha place you recommended for a late lunch, but unfortunately it was already closed. No worries though, I’ll be going back again in late April or May. Thanks for all the recommendations! Palate Envy—I have coined a new term to describe how I feel about your food adventures in Hanoi. Thanks so much for the timely post, I’ll be in VN this April and plan to visit Ha Noi. 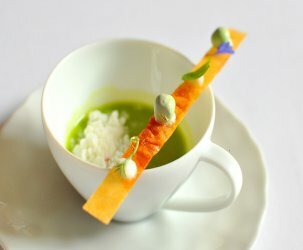 Could you recommend any hotels within walking distance of the restaurants above? At $25 a night, it’s one of the better deals in the area. The time before I was at the Hong Ngoc Hotel on Ma May street (//www.hongngochotel.com/index.aspx), which had a nicer breakfast but was otherwise similar and cost $17 more. Funny to see that the guide books now even recommend the Cha Ca over Duong Thanh way. Most knowing locals have headed that way ever since the folk at Cha Ca on Cha Ca street became rich and decided not to care anymore. There is no love inside that place. I still say the Cha Ca on Cha Ca street of yesteryear was the best I ever had back in the good auld days. Btw you have to try cha ca with mam tom, or did you? Think I remember Monsieur Noodlepie saying cha ca with no mam tom is like fish and chips without vinegar! A sentiment I wholeheartedly agree with. You know, they didn’t even give me any. And I had no idea what I was doing, so I didn’t ask. I’ll certainly have to try it next time, although honestly, I doubt I’ll like it better than with good old nuoc mam.